1951 Goodwood competitor's paddock pass and other motor racing collectables. Homepage. This page: Collectables that relate to the Goodwood motor racing circuit near Chichester, West Sussex. Motorsport events at Goodwood now centre either around the Festival of Speed, held in the grounds of Goodwood House, or the Revival meeting, held at the re-juvenated racing circuit just down the road. The circuit, utilising the perimeter track of the former RAF Westhampnett airfield, first held a publicly-attended race meeting in September 1948, and continued to host races until its closure in 1966 after which it was mothballed, being used for occasional car development work. In 1998 the circuit was brought back to life when the inaugural Revival meeting took place. From time to time I find and buy items that relate to the early years of motor racing at Goodwood, and other post-war venues up to and including 1955, which is the period that my old lorry was in use, transporting a car to this kind of meeting. The more original items that I can find from that era to display with the wagon the better. As time goes by I'll add in some of the original bits and bobs that I turn up. 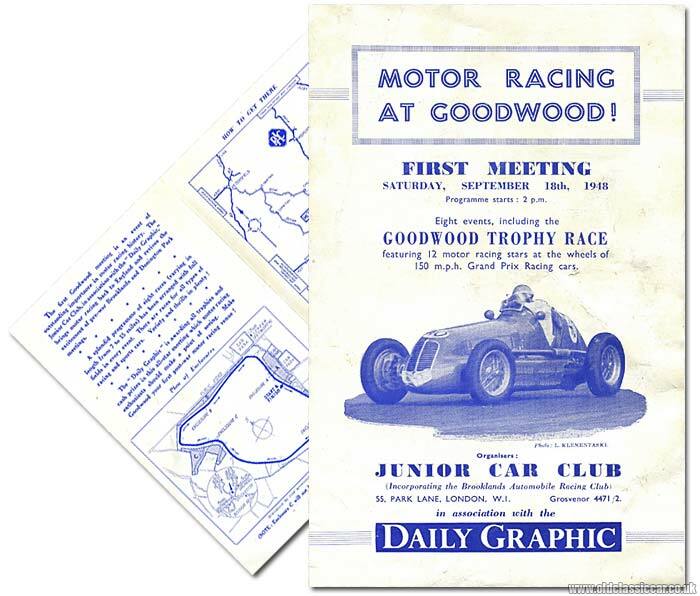 This two page folded leaflet heralds the inaugural Goodwood motor race meeting, due to take place on the 18th September 1948. It was organised by the J.C.C. (Junior Car Club). Eight separate races were planned, ".. featuring 12 motor racing stars at the wheels of 150mph Grand Prix Racing cars". As no member of the public had ever attended a meeting at this circuit before, this handy little publication - produced in conjunction with the Daily Graphic - contained firstly a map showing where Goodwood was located, and secondly a map of the circuit itself. Whether the corners had yet been named or not I don't know, certainly there are no references to Madgwick, St. Mary's, Lavant and Woodcote so perhaps they were still to be finalised? The first Goodwood meeting is an event of outstanding importance in motor racing history. The Junior Car Club, in association with the "Daily Graphic", brings motor racing back to England and revives the excitement of pre-war Brooklands and Donington Park meetings. A splendid programme of eight races (varying in length from 7 to 15 miles) has been arranged with full fields in every event. There are races for all types of racing and sports cars. Variety and thrills in plenty! The "Daily Graphic" is awarding all trophies and cash prizes in this all-star meeting which motor racing enthusiasts should make a point of seeing. Make Goodwood your first post-war motor racing venue! And the price of entry? from 5 shillings per adult. BARC competitor's paddock pass, Goodwood, 1951. I bought both the items shown below in 2011. The first is a competitor's paddock pass for the Goodwood meeting held on 21st April 1951. This would have been displayed in a vehicle transporter, tow vehicle, or the racing car itself if it drove the circuit under its own power. With it is a cardboard lapel badge, enabling the car's driver to access the paddock at will, preparing for the race. Both refer to the organisers of the event, the B.A.R.C., or British Automobile Racing Club. This event was the 5th BARC Members' meeting. More items of a general motoring nature can be found in the Motoring Collectables section. Further Goodwood-related publications and items will be added to this page shortly. Goodwood 9 Hours features in a 1953 copy of Boy's Own Paper. Junior Car Club Gazette - Goodwood Review - 1948.